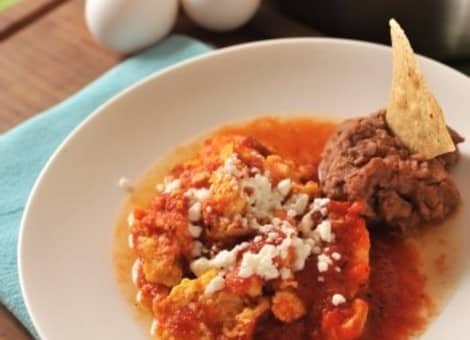 The authentic Mexican egg dish of Huevos Albañil (Bricklayer Eggs) features scrambled eggs that are bathed in tomato sauce or salsa tomatillo (green tomatoes) and are served on slightly crisp corn tortillas with cheese, and cilantro. Served with black beans and rice. Beat the eggs slightly. In a frying pan heat oil and add the eggs. Season with salt, to taste. Mix and cooked, remove from the heat. Reserve. Roast the tomatoes, onion, garlic and on the comal and liquefy. Sauté the sauce in a frying pan with a little olive oil and season with salt, to taste. Cook two minutes. Add the eggs. Cook two more minutes. Serve with refried beans, tortillas and cheese collapsed flask.